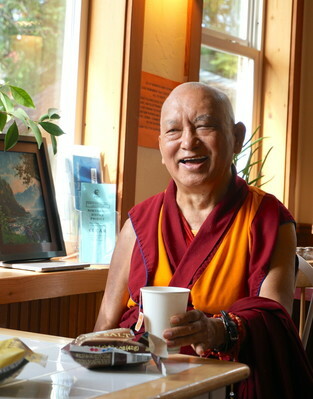 A student who was experiencing many obstacles wrote to Rinpoche. In this letter, Rinpoche advised the importance of Dharma practice for a happy and meaningful life. First I want to introduce to you what is holy Dharma and what is worldly dharma; what is virtue and what is nonvirtue. As an example, for a person making charity to others, whether it is holy Dharma or worldly dharma, virtue or nonvirtue, depends on the motivation. It is not just whether we give food or money that stops the other person’s hunger. If the motivation is with attachment to this life’s happiness, to our own happiness, or if the purpose of making charity is to have people praise us—for reputation, for power and things like that—then that motivation is totally nonvirtuous, it is negative karma and it becomes the cause of rebirth in the lower realms. However, if our motivation is unstained—if we are not attached, not clinging to our own comfort and happiness of this life; if we see that as meaningless, negative karma, not only meaningless, but also negative karma—if we are looking for happiness of our future lives, it can be numberless lives, and for that we make charity, then it becomes Dharma. The action of making charity with that motivation becomes very basic holy Dharma, the first one. It causes rebirth in a higher realm, with the body of a happy transmigratory being, and it causes the happiness of future lives. Making charity with the motivation that is unstained by attachment to our next life’s samsara by realizing how samsara is only in the nature of suffering—having the motivation to cease the oceans of samsaric suffering and to attain ultimate happiness, everlasting happiness, nirvana, the blissful state of peace for oneself—making charity with this motivation is higher Dharma. It is even more pure as this motivation is unstained by attachment to samsara. Making charity with the motivation that is unstained by the self-cherishing thought [is most beneficial.] This means only cherishing the numberless sentient beings, because everyone wants happiness and does not want suffering. Just as a mother cherishes her child the most, we feel like that toward all sentient beings—that they are most precious, most dear, most kind, wish-fulfilling—and we wish to achieve enlightenment for them. [Wishing] to achieve the state of omniscience in order to free the numberless sentient beings from the oceans of samsaric sufferings and bring them to the peerless happiness—the total cessation of all obscurations and the completion of all realizations—making charity with this motivation becomes the cause of full enlightenment. Having the motivation to bring every sentient being to full enlightenment is the best, most beneficial way to make charity. Making charity with this motivation is most beneficial for every sentient being, not only for ourselves. It is most meaningful, so that is the happiest one. We have to understand this first. Thus, charity done with bodhicitta becomes the Mahayana path. We have to understand that every action of our body, speech and mind in our daily life is similar to this. What is nonvirtue and what is virtue; what is holy Dharma and what is worldly dharma; what is negative karma and the cause of the lower realms, and what is the cause of all the different levels of happiness, every level of happiness up to the highest, enlightenment. Using the above example, it is similar for every action that we do. In this way we can understand what it means to practice holy Dharma and why it is so important, most important, to avoid negative karma. To know what is worldly dharma and what is holy Dharma is very important because we want happiness and we don’t want suffering. What we want is all those different levels of happiness up to enlightenment. From this we can see that we need to do everything with bodhicitta. Therefore we need to realize bodhicitta, so that every single action of our body, speech and mind in this life becomes the cause of enlightenment for numberless sentient beings. Our actions become the cause of happiness of this life and in future lives, as well as becoming the cause of nirvana, ultimate happiness, the everlasting happiness for the numberless sentient beings, the peerless happiness, full enlightenment, for all sentient beings. So now you can see why holy Dharma is the most important thing in your life, more important than anything else. Even if we have a job that brings us a billion dollars every day, there is no comparison to doing every action with holy Dharma . Doing every action with holy Dharma is the most important thing. Even if we receive a billion dollars each day as the salary for our job, that alone doesn’t help us to be free from the lower realms. In fact it causes attachment to arise and that causes rebirth in the lower realms. Even if we don’t have attachment to this life, but we have attachment to our future life’s samsara, by receiving that billion dollars it becomes the cause of samsara. Without bodhicitta, with the self-cherishing thought, even if we receive a billion dollars every day, it doesn’t cause us to achieve enlightenment. We haven’t achieved enlightenment yet, from beginningless time. We have been suffering from beginningless time, not only in this life. Why we have been suffering in this life is because in our previous life we were suffering, and why we had suffering in that life is because the life before that was suffering, and the life before that was also suffering, and so on. We have been suffering from beginningless rebirth. Therefore, every second it is most important to do every action with bodhicitta and to do every action with ultimate wisdom—the wisdom realizing emptiness—or at least meditating or being mindful of emptiness. We must live our life with that and do every action, every practice with that. In the morning when we wake up and get dressed, we need to check if our motivation is attachment to this life. For example, when we wash in the morning—is it with attachment to this life? When we eat breakfast—is it with attachment to this life? To our own happiness of this life? When we go to our job, is it with attachment to this life? For however many hours we work, if it is with attachment to this life, then for that many hours we are basically busy creating negative karma and the cause of the lower realms. This is not only while we are at work, but from the time when we wake up and get dressed, everything we do becomes worldly dharma. When we eat lunch, is it the same motivation, just for this life’s happiness? When we eat dinner, is it with the motivation of attachment to this life? Then especially when we go to bed, is it with attachment to this life? Because we are feeling tired? From this we can see that almost everything we do becomes negative karma; every action of body, speech and mind. From this we can understand, also because I have already introduced before how our actions become negative karma. Everything—every action of body, speech and mind—becomes the cause of the lower realms, the cause to suffer for a long time, for eons and eons and eons. This is just going through one day in our life, but it is like this from birth to death. I am also talking about myself in this explanation. Another example is this. There are restaurant owners, even Tibetans and Chinese, who have to arrange to kill many animals every day. For example, if the restaurant is in a big hotel, they have to order the killing of many animals. If there is just one person eating one plate of insects, different insects—especially the Chinese do this—then in one day they have to order the killing of more than a thousand animals or many thousands of insects. If it is a big hotel, then maybe 100,000 insects or a million, so many get killed. Wow, wow, wow! So many different sentient beings are ordered to be killed. Even though the restaurant owner doesn’t kill them, they have to order all the killing. We can’t imagine, for years and years and years, if a lot of people come and if the food is good, then a lot of money is made, so much money. People think that the restaurant owner is very rich and very successful, but they don’t think about his next life, about reincarnation and karma. They only think about how it appears right now. Also, when people make a lot of money, they think, “I am successful, my business is very successful.” Or if they don’t have much sickness in the life, if they live for a very long time, they think that this is very good, a positive thing. But in reality, they create a lot of negative karma. Every day they create the causes to be born in the lower realms and to suffer for eons and eons and eons as hell beings, hungry ghosts and animals. The other way is that due to past good karma created, we are born as a human being but we have a lot of suffering, diseases and many problems; for example, we may have a short life. Not just one time; this can go on for hundreds or thousands, or hundreds of thousands, or millions, or billions of times. For each karma of killing, we are then killed by others. We have to experience that karma for five hundred lifetimes. Killing also has three other suffering results. Even if by chance we are reborn as a human, we have to experience the karma of the result similar to the cause, so again we do the act of killing, or we get killed, we have a short life, or we experience the possessed result, which is to do with the suffering of the place. This is from one negative karma. I am mentioning this because maybe you never thought about this. I am telling you this so you can learn what is true, holy Dharma practice, whether as a lay or ordained person. Even if we get very sick many times, and maybe almost died, or if we have a short life, this is actually good. Why? Because with pure, holy Dharma practice then all that past heavy negative karma is experienced in this life as some catastrophe or sickness, but then it is finished. Then after death we can go to the pure land and become enlightened there, or we can go to different pure lands or at least we can receive a perfect human rebirth where we can meet the Mahayana teachings. We can meet a perfectly qualified Mahayana guru who reveals the path to enlightenment, and then by pleasing the holy mind of the virtuous friend we can achieve enlightenment as quickly as possible. Then our future lives are like the sun shining, which makes the plants grow, and which animals, human beings and everyone in this world enjoys. By pure practice of Dharma if we experience catastrophes, sickness or many problems in our life, we are actually purifying all those heavy negative karmas that cause us to be reborn in the lower realms over and over again, and have to experience that incredibly heavy suffering for eons and eons and eons. We are purifying those heavy negative karmas, so that we don’t have to suffer in the next life and we can achieve incredible happiness and go toward enlightenment. The hotel owner who lives with pure attachment to this life, doing everything from morning to night, living like that, day and night, maybe he has a long life and no sickness. Maybe he is very wealthy and successful now, but in the next life he will go to the lower realms and experience the heaviest suffering. Compared to the unbearable suffering in the lower realms, any human suffering imaginable is actually the greatest pleasure. It is like peace and happiness compared to just one hour or one minute as a hell being and experiencing that suffering. Therefore if we don’t know karma and if we don’t know our mind, then we don’t know about our life and we live in a total hallucination. By not creating virtue and only creating negative karma. And suffering and ignorant, at that time what shall I do? I won’t even hear the sound of the happy transmigratory being (a human voice). —tomorrow or the next life. It is more worthwhile to work for the next life. This means to work for the next life, to make preparations for the happiness of future lives, is more important than the happiness of tomorrow. This means being too lazy to practice Dharma now. I have already explained quite a bit to you about what real Dharma is. Whether you will die and be reborn in the lower realms. And create the cause of happiness for your next life. Then you will have happiness at the death time and happiness up to enlightenment. Is like an elephant getting caught in mud. Is like a dog chewing a bone. It is like being blind and unable to see the precipice. It’s like jumping and believing there is a road, but it is a precipice. With ignorance we create the negative karma to go to the lower realms. Is like a poisonous snake meeting a musk deer. Is like a bee caught in honey. Be frightened and cast all these away, a long distance. This is very important. You have to think well about each verse and then you can understand. This is my introduction to you about this precious human body, which is qualified with the eight freedoms and ten richnesses. You can achieve this, but it is very difficult to find again and again. When it is found, it is so easy to perish. The whole emphasis is to practice pure Dharma and to live your life with bodhicitta, therefore it is very important to study Dharma and to practice as much as possible. Please read this again and again, not just one time. The quote below is very important for you to realize, for your discovery, to wake up. Please grant me blessings to generate the thought of seeking the life beyond this life. This means the happiness of future lives. It is definite we have to be separated from them. It is definite we have to be separated from these. Not only is it definite that we have to be separated from these, it can happen at any moment. This is talking about the reality of life. Ordinary people always wish to not be separated from these, but the reality of life is that we will always have to be separated. After meeting, we have to be separated. After collecting, it has to finish. After birth, there is death. This is the reality as explained by the Buddha. The view of ordinary, worldly people is to desire the first part, but the reality of life is that we have to experience the second part. Why I am explaining all this to you, all these quotations, is because you need to understand the reality of life and how to practice holy Dharma. This means for your mind to become familiar with how to think about the reality of life. It is definite, one hundred percent, that this will happen at any time, at any moment. Therefore, however much you have become familiar with this, even if you haven’t got any realizations, just by being familiar with this it is easy for the mind to not get shocked, depressed, crazy or even suicidal. By realizing this you can be very happy, so happy. Why? Because there is no attachment to life, to what is happening. Therefore you can have so much happiness in the life. Less desire means more satisfaction and more inner peace and happiness. This is what Dharma is. We have to understand the meaning of renunciation. In the world ordinary people believe it is the other way around. They don’t expect the second part, that things will change, and then when something does happen it is a big shock, because they don’t usually think about that. Then when something happens they don’t know what to do, what the answer is in their life. This is even for rich people who seem to have everything or so much more than others. Even though the dragon has a great sound, it is empty. Even though the rainbow has a very good color, it disappears. Even though we have desire enjoyments, it is all the cause of negative karma. For example, think about a king who has many millions of servants and so forth, hundreds or thousands or millions. Or a business person who is regarded as very successful in this world, who has ten-star hotels in many countries of the world, who has so much money and possessions. If they are not practicing Dharma and they have the motivation of attachment to this life, then however much wealth they have, there is that much attachment—so much, so much, it is unbelievable. The beggar living in the street, who is begging for food each day, who has nothing, does not have much attachment, unlike the very wealthy person. Of course the wealthy person who has a five-star or ten-star or even more star hotel thinks, “I need more,” so they are always looking for more. Even though they have enough material possessions for thirty, forty, fifty or one hundred lifetimes—they have enough to live on, but they are always comparing themselves with someone who is richer than them. Compared to that person they think they are poor; they always want to be richer than any other person. They are always thinking like that. There is so much dissatisfaction there, thinking, “I want to be richer than other people,” or “I have less.” Then there is great mental suffering. The beggar who lives only begging for food every day doesn’t have as much mental suffering. We have to understand that there is so much mental suffering. That is why many rich and famous people, singers and actors, commit suicide. It is due to mental suffering, having so much dissatisfaction. As Milarepa says: “No matter how famous you are, it is like the sound of the dragon, empty. No matter how beautiful you are—your body or your house— it is like a rainbow, it disappears.” And it can happen anytime. Also, as I already explained, however much enjoyment and happiness you have, there are that many causes of suffering. Therefore, you have to think about this well. This is not just a very quick thing to understand. You have to think about this over and over again. Everything that is done is meaningless and the cause of suffering. Whatever we think, nothing benefits. This means it does not benefit at the deathtime or in our future lives. What he said is very true. For example, we learn so much at the university or when we explore places. We learn so much in the world, for example, from Western science—not Buddhist science, but Western science—but on the day when we die, at the hour, at the moment of death, all this has to be left. None of this has any benefit at the time of death, when our consciousness separates from our body. There is not one single benefit from all this education. However many degrees we have, however famous we are, there is not one single benefit in that at the time of death and also it has no benefit for future lives. It’s very important to remember this, to always be habituated in this way of thinking and watching our mind. I already explained the difference between what is holy Dharma and what is worldly dharma; what is virtue and what is nonvirtue. It depends on the mind. All the different levels of happiness up to enlightenment come from the mind. I already mentioned that at the beginning. By always looking at our mind we can understand if what we are doing is the cause of suffering or the cause of happiness; worldly dharma or holy Dharma; the cause of enlightenment or the cause of the lower realms; whether it is the cause of samsara or nirvana; and even in our life whether it is the cause of suffering or the cause of happiness. This much is enough for you at the moment. This is my introduction to Buddhism, how important it is in the life. What is the real one, which really makes a satisfied life and the cause of happiness, the most meaningful life for every sentient being, is bodhicitta. Thank you very much. Therefore, if you don’t change your mind, [the result] is suffering. If you accept the reality of life, this is Dharma, which then brings happiness, inner happiness in our life up to enlightenment.